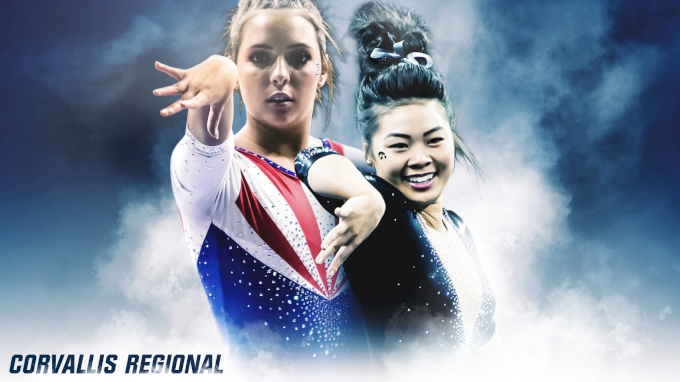 On the first night of the three-day NCAA gymnastics regional in Corvallis, Iowa and Arizona matched up in a dual meet. Arizona started off strong, but Iowa eventually overtook the lead, passing Arizona by a larger margin with every rotation. The final score was 195.850-194.550, and Iowa will move on to tomorrow’s regional competition. Iowa began on vault while Arizona started on floor, and then the teams flipped events. Iowa began on beam for the third rotation while Arizona took floor, and the teams switched again moving into the fourth rotation. Watch the Corvallis Regional LIVE right here on FloGymnastics! Haylie Hendrickson kicked things off for Arizona on bars, and the senior scored a solid 9.775, with a Jaeger and only a small step on a double layout full twisting dismount. Heather Swanson was next, scoring a 9.700 with a few small errors. Swanson, a junior, performed a nice Tkatchev and a double layout dismount. Freshman MacKinzie Kane’s 9.200 score was dropped after a fall on her Jaeger, but Danielle Spencer picked it up during Arizona’s fourth routine, scoring a 9.900 with a huge Tkatchev, good handstands, stuck double layout, and nice flow between skills. This 9.9 matched her season- and career-highs on the event. Scoring a 9.885, Maddi Leydin had her legs a bit apart during her pac salto, likely where the deductions came in, but performed a flawless Markelov release on high bar. Christina Berg, ranked 12th in the nation on bars, anchored for Arizona and scored a 9.750 after a stuck landing and clean routine. The Wildcats ended the rotation with a 48.975 team score. Iowa started on vault, and after six gymnasts, had a score of 48.800. Their lineup consisted of Nicole Chow (9.675), Misty-Jade Carlson (9.750), Charlotte Sullivan (9.775), Bridget Killian (9.750), Lauren Guerin (9.775), and Erin Castle (9.750). Sullivan competed a Yurchenko half and had quite a solid landing, even though she came in blind. Killian’s Yurchenko full was a bit piked, likely where we saw the deductions on that vault. Guerin had a Yurchenko full that was nice other than a slight hop on the landing, and Castle tied her career high on vault with a huge, soaring vault, after bailing on her first attempt. Castle ran down the runway once but did not touch the vault so she got to go again, and when she did, she delivered. On rotation two, Arizona vaulted, leading off with Jenny Leung. This starter scored a 9.700 with a Yurchenko. Next up was Kennedi Davis, a freshman who had a large hop on the landing of her Yurchenko full, scoring a 9.650. Swanson scored a 9.800 for her Yurchenko full, which was neat and only had a small step on the landing. Adra Parks scored a 9.775, then Leydin brought in a 9.750 for her Yurchenko 1 ½. This vault starts from a 10 but has a blind landing, and although her feet were a bit apart on the landing, she had huge height. Kane anchored for Arizona, scoring a 9.625 on a tucked Yurchenko full. This left Arizona with a 97.650 team score after the second rotation. Iowa took the lead during the second rotation, after they went to bars and had a very strong rotation. Clair Kaji opened up the event, scoring a huge 9.800 after a strong lead off. Besides having her chest slightly down on the landing of her double layout and her feet slightly apart on her pac salto, her routine was flawless. Emma Hartzler was up next, but fell on her piked Jaeger, her fingertips barely missing the bar. She got back up and stuck her double tuck dismount out of her giant full, but her score was still dropped. Sullivan scored a 9.800 to match Kaji, with an amazing Tkatchev and only a small hop on her double tuck dismount. Maddie Kampschroeder followed and only received a 9.575 after having extremely bent legs on the flight portion of her toe-on Tkatchev. Still, this form break was the correct move to make, as without it she was very close to the bar and likely would have hit the bar and fallen, counting a half point fall and possible injury. With her form break she avoided that, and finished with a strong double layout. Chow scored a 9.900 with a huge toe-on Tkatchev, high flight and good lines, as well as a stuck double tuck, showing she was unfazed by her teammates’ mistakes. Jax Kranitz anchored the team, and showed high energy, making her perfectly hit handstands look effortless, and showing off a strong, bold routine ending with a stuck double front tuck. This rotation left Iowa slightly in the lead with a 97.725 as the Hawkeyes headed to beam. Arizona competed on floor for its third event and brought the energy. Hendrickson started off the rotation, scoring a 9.450 after some issues in her routine, including a final pass where her front layout was quite low and barely made it around. Sydney Freidin brought her score up to a 9.525, although she was deducted for landing with her chest down on her first pass, a double tuck, as well as landing out of bounds. Swanson and Davis both scored 9.700s, with Swanson competing a high double tuck and a double twist into a punch front. Leydin scored a 9.925, having lots of fun during her routine with her teammates dancing on the sidelines. She competed a front tuck step out into a roundoff back handspring double tuck, a double pike, strong leap series, and lots of fun dance choreography. Christina Berg anchored on floor for Arizona, giving Arizona a 48.625 for its third rotation, heading into beam with a 146.275. Iowa ended its third rotation with a 146.650 after strong beam routines that gave them an additional 48.925. Carlson scored a 9.725, and Allie Gilchrist followed with a 9.675 after a small balance check on her acro series, a back handspring back layout to two foot landing. Killian scored a 9.700 before Kaji and Chow both put up 9.850’s for Iowa. Kaji was very secure in her routine, floating through her back handspring back layout series and her cat leap to aerial connection. She took her time with her dance, looking strong, and stuck her gainer dismount, though her chest was slightly low and her feet were a tiny bit apart. Chow also stuck her gainer dismount, prompting lots of cheering from the crowd. Sullivan anchored with a 9.800 with a stuck side somi and incredibly solid front aerial to back handspring as well as a stuck round off double twisting dismount. Her smile at the end said it all: Iowa was looking strong and confident heading into the last rotation. Arizona’s last event of the night was beam, and head coach John Court put Davis up first, where she delivered a 9.725. Following Davis was Leung, who looked right at home up on the beam, with nice choreography and lots of difficulty. Leung competed a back handspring back layout with no wobbles, a switch leap switch leap, and a cat leap to an aerial, scoring a 9.850. Leydin fell on her side somi out of her cat leap, scoring a 9.125. Right behind her was Freidin, who did a back handspring, and paused after a huge wobble. She retraced her steps and went for her acro series again, this time completing the back handspring back layout and getting both feet on the beam but eventually falling off, sealing Arizona to its fate of counting a fall towards its team score. In the end, although the Wildcats were already a bit behind, counting this fall is what committed Arizona to a loss. Courtney Cowles and Hendrickson picked it up, scoring 9.750 and 9.825, respectively, after being put under lots of pressure to hit their routines. Despite the comeback, it was not quite enough: Arizona finished with a 194.550. Iowa ended with a final score of 195.850 after its last rotation, floor. Gilchrist opened with a 9.750, competing a front Rudi and a double front twist. Her routine was clearly a favorite among her teammates, who danced on the sidelines and cheered her on to open up their floor rotation. Killian scored a 9.825, with a tuck double back that made her stand out from all the other double backs that day that landed with a step back on the landing. Sullivan competed a front tuck step out into a roundoff back handspring 2 ½ twist, then quickly turned around and competed a double tuck. Sullivan is strong under pressure, having competed for New Zealand internationally, and showed that today on their final event, scoring a 9.800. Guerin scored a huge 9.900, with great height in her routine, especially her front tuck step out to roundoff back handspring double tuck. Kaji was a true performer, scoring a 9.875 for her huge routine and entertaining with great showmanship. Castle ended the meet, scoring a 9.800 and having fun out on the floor, knowing her team had already hit the five needed routines. With the pressure off, she competed a roundoff double pike and a Rudi, as well as a strong third pass. With Iowa beating Arizona 195.850-194.550, Iowa will move on to tomorrow’s competition in Corvallis, facing SEC champ Florida, host team Oregon State, and Stanford.